Firefighters work to douse the fire at the historic Trinity Evangelical Lutheran Church in downtown Milwaukee Tuesday afternoon. 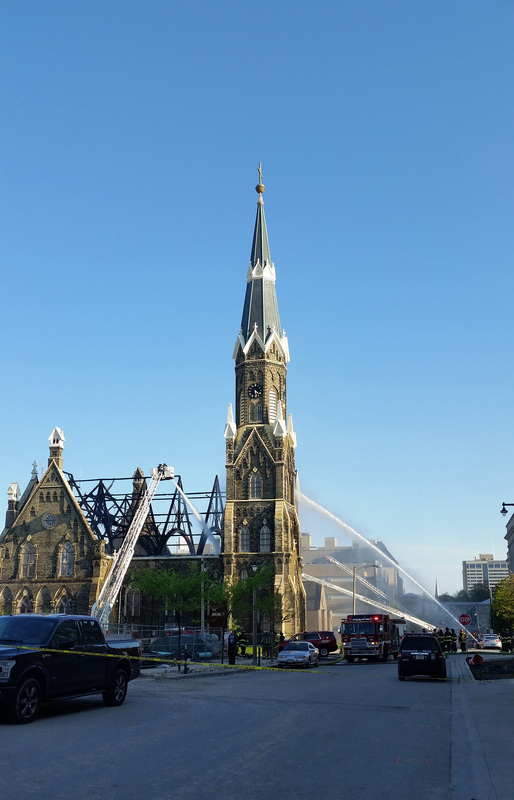 A 140-year-old downtown Milwaukee church was heavily damaged by fire Tuesday. The blaze at Trinity Evangelical Lutheran Church broke out Tuesday afternoon and kept dozens of firefighters busy for hours. Deputy Milwaukee Fire Chief Christopher Snyder said the fire started at about 3:45 p.m. No cause has been announced, but the pastor said construction work was being done on the roof. Trinity is a state historical landmark, and it's on the National Register of Historic Places. Paul Demcak of nearby St. John's Lutheran came to see the damage. He said it's awful to lose a place of worship to fire. "It's where people have marked important things in their lives: baptisms, marriages, confirmations, weddings, funerals. These old churches are where people call for genealogical information. It's a home. It's a church home," Demcak said. He said he hopes Trinity will be able to rebuild. Despite the fire, the steeple and brick walls remain standing. Trinity was founded by German immigrants in 1847, and occupied several sites before the current church was built in 1878. Trinity says it was the first Lutheran congregation in Milwaukee to welcome African-Americans, doing so in 1949.